Geese have their natural predators- several of them. Goslings are taken by crows, magpies, gulls and herons from the air. But without doubt the biggest enemy comes from the ground attackers. Geese have voracious natural predators, who have a far lower mortality rate than the numbers of geese on which they predate. The birds are watched constantly from the waterside and within the reeds. Adult geese are certainly also vulnerable to being killed, stalked from the shadows as they graze on the bankside. Their predator and mortal enemy – Vulpes vulpes, otherwise known as “the red fox”. 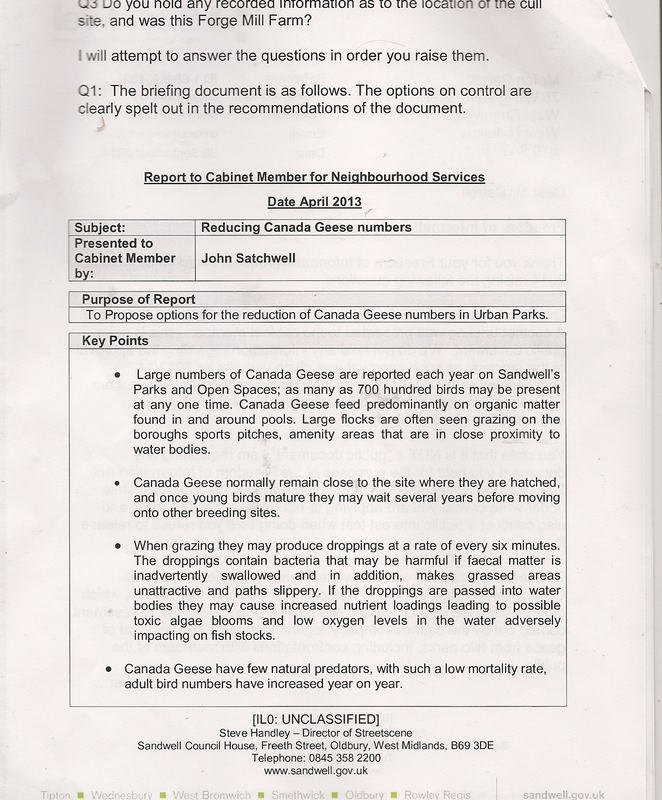 Over the years I have been fully aware of the danger posed to wildfowl from the land. Unfortunately they have put pay to several rescues I have attempted of previously injured birds by getting to the bird first, leaving them with no heads. Power line casualties are very often finished off by foxes, removing all trace of the real cause of death. 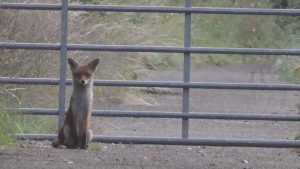 It is also unfortunate that though persecuted themselves, the fox appears to have very much in common with those humans who hunt them in the manner in which they stalk, poach and hunt mercilessly themselves. It is however “nature” that determines both the destiny of the fox and the goose, a necessity and not perverted self gratification. 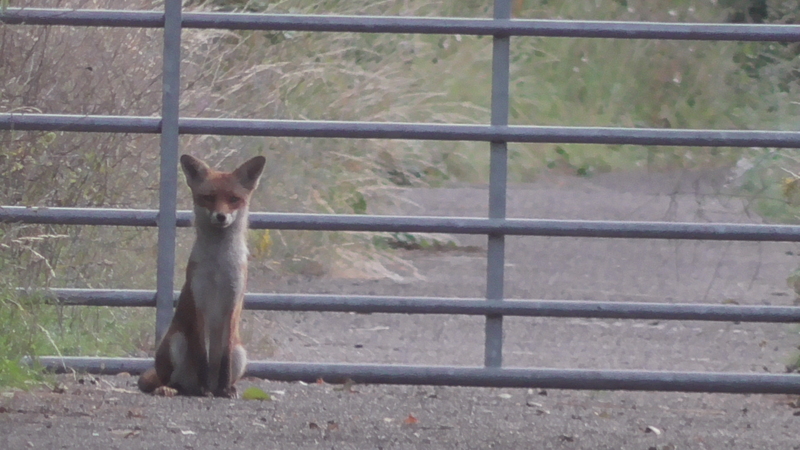 I recently had an interesting first hand encounter with some foxes that were clearly out to grab a goose or two for dinner. 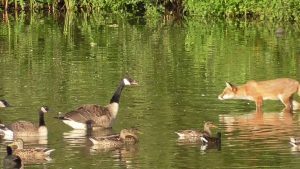 I suddenly heard loud honking which I recognised as the goose distress call- particularly used when the geese spot a predator and are in the presence of their goslings. The mallards on the pool were also quick to usher a collective braying quack. They were not alone on the pool, and they were being watched from the reeds. 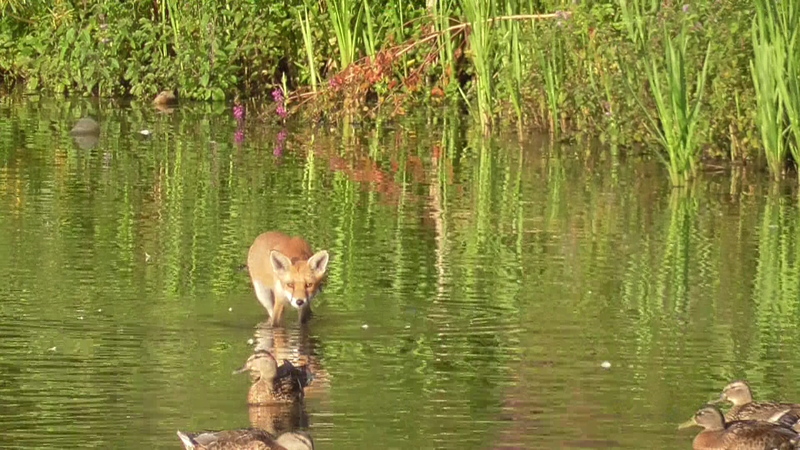 As one fox remained at the bankside, another entered the water where the level was shallow. 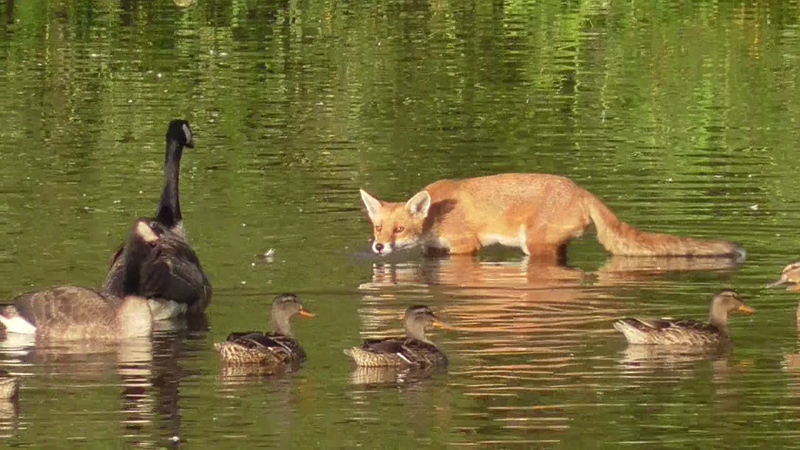 It is the first time I have seen this, though foxes themselves are very good swimmers, like other domestic dogs. It was clear that this fox had on its mind the 19 geese in front of it. As it got deeper into the water, paying some causal attention to its human watcher, the geese began to coral themselves into a circle, as the chief gander began to defiantly honk away at the intruder. This was not a friendly encounter, it was a matter of life and death. Had the geese been at the reed side there would have been a different outcome. 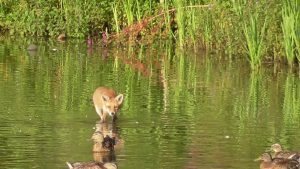 The fox then started to lower its body and head, almost like the geese do when in a threatening posture, or to try to hide themselves. 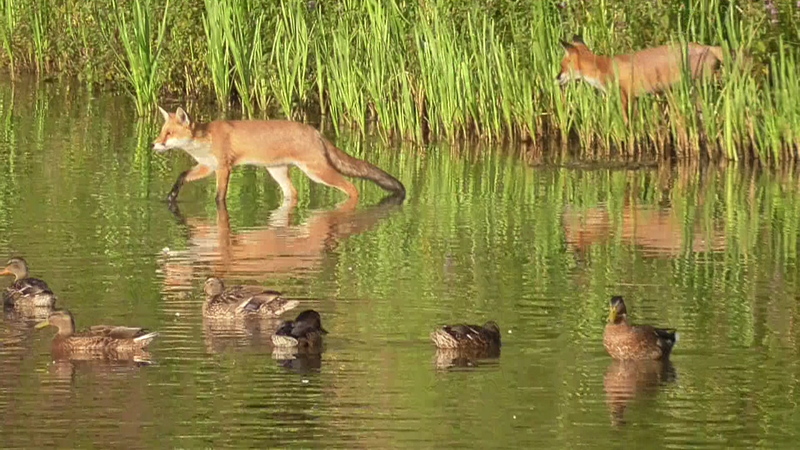 It was trying to get behind the geese and send them into the reeds, where no doubt the second fox was poised to strike. But the geese stood strong, and it was obvious to the dog that it was not going to get a meal. 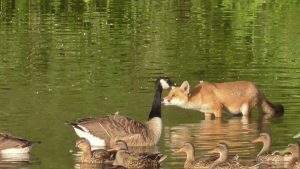 A strange thing then happened when the fox decided to pick up a stray goose feather in its mouth and then spit it out when retreating back towards the reeds. 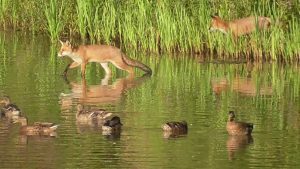 It is also fair to say that at this point of the year, post moult, that the fox is at a disadvantage given the geese can now fly again. 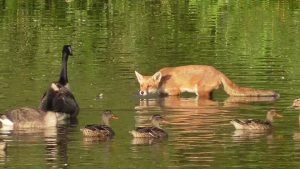 Perhaps prompting the fox into taking a bold attempt at waterside hunting. Not by the feather of my goosey goose chin! But don’t be in any doubt about this voracious predator of geese. Of the 40 plus goslings on this site, currently less than a quarter remain, with 5 adult protectors which would indicate that one adult has also been lost. I have no doubt that the watchers in the reeds take their chances- but that’s natural predation for you.